It's and we would like to welcome you to the Salt Lake Tourist & Visitor Centers official online edition. This page provides detailed information on buses from Salt Lake City to Zion National Park. From Salt Lake City to Zion National Park is approximately 307 miles. Take I-15 S toward Las Vegas, NV. Take UT-17 (exit 27) toward Toquerville/Hurricane. Take UT 9 East to Springdale. From Las Vegas, NV to Zion National Park is approximately 163 Miles. Take I-15 N toward Salt Lake City. Take UT-17 (exit 27) toward Toquerville/Hurricane. Take UT 9 East to Springdale. Buses from Salt Lake City to Zion National Park. Driving through the east side of Zion to U.S. Route 89 allows access to Bryce Canyon National Park in the north or to the north rim of the Grand Canyon in the south. Due to the narrowness of the Zion-Mount Carmel Tunnel, RVs and buses must obtain a special pass and can only drive through the tunnel during limited hours. 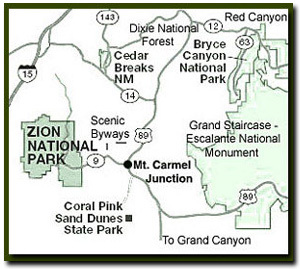 The more primitive sections of Zion include the Kolob Terrace and the Kolob Canyons. The Grotto in Zion Canyon, the Visitor Center, and the viewpoint at the end of Kolob Canyons Road have the only designated picnic sites. Seven trails with round-trip times of half an hour (Weeping Rock) to 4 hours (Angels Landing) are found in Zion Canyon. Two popular trails, Taylor Creek (4 hours round trip) and Kolob Arch (8 hours round trip), are in the Kolob Canyons section of the park, near Cedar City. Hiking up into The Narrows (Zion National Park) from the Temple of Sinawava is popular in summer. However, hiking beyond Big Springs requires a permit. The entire Narrows from Chamberlain's Ranch is a 16-mile one way trip that typically takes 12 hours of strenuous hiking. A shorter alternative is to enter the Narrows via Orderville Canyon. Both Orderville and the full Narrows require a back country permit. Entrance to the Parunuweap Canyon section of the park downstream of Labyrinth Falls is prohibited. Other often-used backcountry trails include the West Rim and LaVerkin Creek. Zion is a center for rock climbing with short walls like Touchstone, Moonlight Buttress, Spaceshot, and Prodigal Son being very popular. Lodging in the park is available at Zion Lodge, located halfway through Zion Canyon. Zion Lodge is open year-round and has motel units and cabins, as well as a restaurant, cafe, and gift shop, but rooms fill up fast. Three campgrounds are available: South and Watchman at the far southern side of the park, and a primitive site at Lava Point in the middle of the park off Kolob Terrace Road. Watchman is the only campground in the park that takes reservations. Lava Point has only primitive facilities and is usually open from June to October. Overnight camping in the backcountry requires permits. Guided horseback riding trips, nature walks, and evening programs are available from late March to early November. The Junior Ranger Program for ages 6 to 12 is active from Memorial Day to Labor Day at the Zion Nature Center. Rangers at the Zion Canyon Visitor Center and the smaller Kolob Canyons Visitor Center can help visitors plan their stay. A bookstore attached to the Zion Canyon Visitor Center, run by the Zion Natural History Association, offers books, maps, and souvenirs for sale, with proceeds benefiting the park.